Box #6: Zucchini season begins! Celebrate Animal Place’s 24th birthday with big pig-out BBQ on July 6th! Enjoy delicious veggie burgers and hot dogs, along with cupcakes. 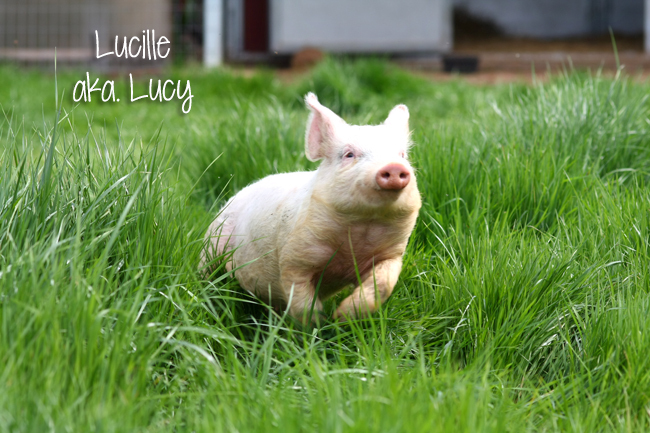 Most importantly, have fun with the rescued farmed animals…get a chance to feed the pigs some fresh fruit and veggies (they want to pig out too)! Pre-registration is required. Open to all ages – a great event for the family! Order your tickets here. Dark Green Zucchini – the summer season truly begins with these beauties! Check out the recipe below. Varna Leeks – this variety can be eaten raw in salad, or substitute this for onions in any recipe. Leeks need a little special washing, as gritty soil can be caught between layers. Check out this post for tips on cleaning leeks. Kohlrabi – that’s the last of the space invaders veggie for this season. Be sure to peel off the tough skin. If you’re unsure of what to do with them, simply grate them over a salad or in a cole slaw. The flavor is mild and nutty, almost like broccoli. Dino Kale or Ripbor Kale – the kale has suffered some intense insect pressure. We harvested the best of it for you, but there may still be some noticeable damage. Still perfectly edible! Green “Golden Acres” Cabbage – that’s the last of it! Think salad, stir fry, cole slaw or kimchi. Carrots – that’s it for carrots until the fall, folks! Hope you enjoyed them. Fresh parsley – add it to salad, tabouli or any juice. Very alkaline food! Fresh basil – eat raw, cooked or make pesto! Stay tuned for details about our field stand, which will be open to sanctuary visitors and any passerbys in Grass Valley. 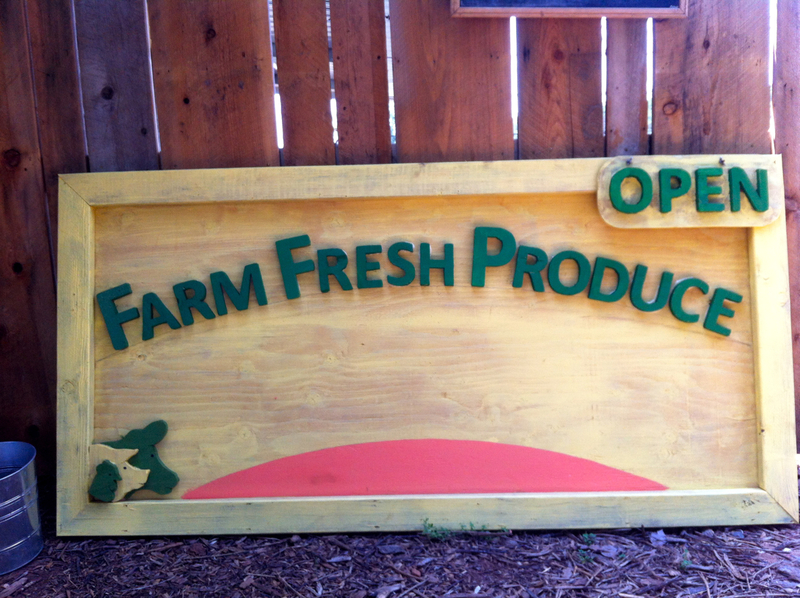 In fact, we hope to draw more visitation to the sanctuary through our fresh veggies. Set aside one of the zucchini; trim and coarsely chop the rest. Cook onion in a large saucepan for about 5 minutes, until softened. Add the garlic and cook for another minute. Stir in the chopped zucchini, salt, and pepper and cook over medium heat, stirring occasionally, for 5 minutes. Add the broth and simmer until zucchini is tender, about 15 minutes. Pour into a blender (in 2 batches, if necessary) taking care to avoid burns by not filling the blender more than halfway. Add the basil, cashews, and nutritional yeast and blend until smooth. Return soup to the pot, season with salt and pepper to taste, and keep warm. Shred the remaining zucchini with a spiral slicer, mandolin, or grater. 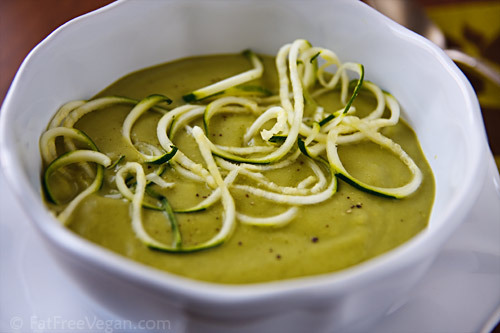 Pour soup into bowls and sprinkle grated zucchini over top. Can be served hot or cold. Yum!